The very smallest crescent moon just moments after sunset, called the Cheshire Moon after the infamous cat in Alice’s Wonderland. My friend, April, mentioned the Cheshire Moon in one of her Facebook status updates. I had forgotten the special name of this moon with the upturned smile. I renamed the image after April’s posting. I kept saying, “Just a moment.” And, “We will be leaving soon.” Half an hour later, I had this image, and she had relief. 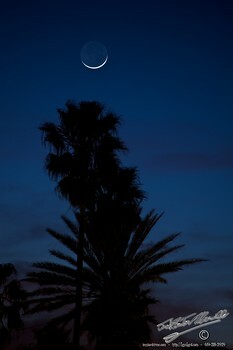 This entry was posted in Landscape, Nature, Purchasable - As Art Prints, The Moon. Bookmark the permalink.